Enjoy live music at Ricky T’s. They feature some of Treasure Island and St. Pete’s hottest local bands – Kirk Adams and the Honey Badgers, Cornfused, Stormbringer, Pete & Dean, Big Brother, Bus Fulla Monkeys, and of course, the infamous Kevin Toon. They have over 25 huge flat-screen, HD TVs with digital surround sound. You can watch NFL Network, NFL Sunday Ticket, Rays games, NASCAR Sundays, and more! Interested in buying or selling a condo or home in Treasure Island? Treasure Island Condos or Treasure Island Homes sections! 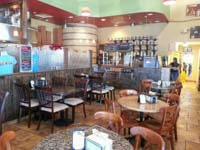 I have another great restaurant for you to try, Britt's Pizza, located at 10709 Gulf Blvd, Treasure Island FL 33706. They have delicious homemade pizza's cooked on their open coal fire, which was really neat to see, as well as pasta's, subs and salads. When I went I dined on the inside, but they also have a front patio to enjoy the breeze, and and the patio is also pup friendly! On Friday's and Saturday's they have live music on their patio, which would be nice to listen to music and enjoy a yummy pizza. When I went for lunch the other day, my Dad and I split a medium Veggie Pizza and we both had a house salad, which was perfect. 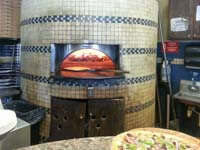 The pizza had mushrooms, green peppers, red onions, roasted garlic and calamata olives. The crust was perfect and there was just the right amount of sauce! When I go back, I would love to try the White Pizza, which has a white sauce with mozzarella, romano, ricotta, spinach and tomato! If you would like to enjoy Britt's from you own home, don't worry! They deliver! Just give them a call and they will let you know if they deliver to your area. If you have a party or get together coming up, Britt's also caters! Next time you are in Treasure Island, check out Britt's Pizza, the restaurant that I think has the BEST coal fire pizza in town!